As a writer your main platform is your blog, if you don't haven't created your own author platform check out this blog post How to Start Your Author Platform from Scratch . Your blog allows you to get your message across, and your voice to be heard. It takes many hours of thought and writing to put words on the screen. Blogs are being created on a daily basis, by the truck load. Which makes it more important to understand what attracts your audience and helps retain your followers. There's nothing wrong with making mistakes along the way, believe me I've made plenty. You can't make an omelet without breaking eggs. When I first started my blog, back in March 2015 I was only posting once a week, because I had too many other things going on. I soon realised that posting once a week wasn't enough for a new blog. Blogs are very similar to magazines and newspapers, they require fresh content regularly, to keep your readers interested. Posting too frequently also has it's downsides, it can seem like a lot of information to be taking in when you post that frequently. You need to find a pace of posting you can manage and that your readers feel comfortable with. Interacting with your audience can be difficult, but I encourage all bloggers to leave their comments on, and reply to comments that are relevant to your blog. There's nothing wrong with a droll or sarcastic post every once in a while. But doing it too often may make your readers feel uncomfortable. Keep it light and you can't get go wrong. Quality images throughout your blog is key to holding your audiences attention, and creating your own particular style. 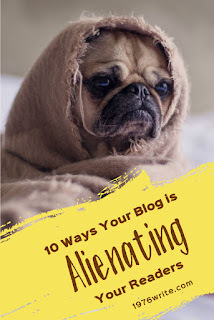 Your blog needs to be attractive and easy to get around. Stay close to home, when it comes to blog topics. For instance if your blog is about cars, don't talk about dogs. Blogging about anything that comes into your head only works if your blog is focused on different subjects. Otherwise you confuse your readers. Be creative, dig deep, and your sure to find plenty to talk about. Only comment on other peoples blogs if you have something encouraging to say, or worth saying. Blogging is all about sharing and discovery, not advertising your own blog. Your audience doesn't need to read 3,000 word articles all of the time, vary the lenght of your posts. It's clear that people don't have the attention span they used to have, so try writing blog posts of varying lengths. Great bloggers are those who share content from other bloggers. Make sure you join Facebook, Twitter or Pinterest to promote your your posts. Great tips, thank you. It would nice to be able to get some readers to my blog in the first place...Any tips or resources that you are aware of that could help me with this? Hi Steve, thanks for your comment. What's your blog address, so I can check it out?